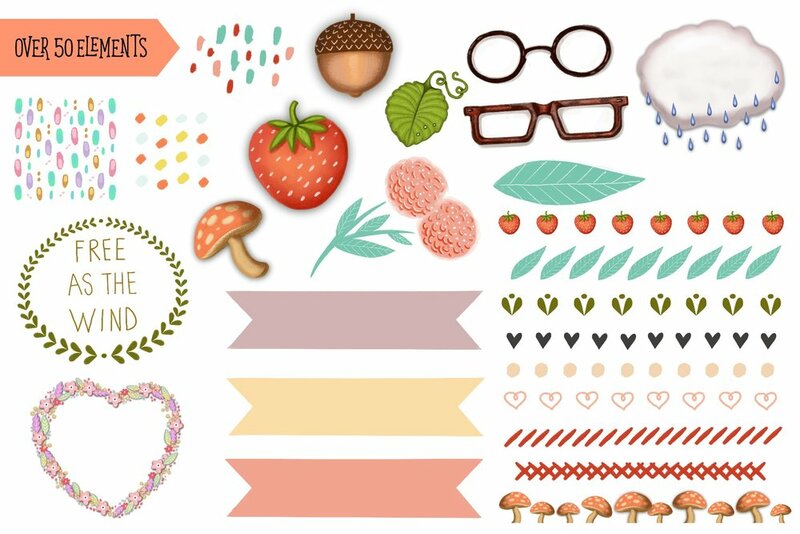 The 'Just Elements' pack is a diverse collection of hand drawn elements for you to use to personalize your projects! In this pack I've included EVERYTHING you will need to create all of the projects you see in the preview images for the Character Pack of Girls and Boys! Scroll Down to see everything you get in this product! Are you an Etsy Shop Owner or a Creative Entrepreneur? You can use all the illustrated elements and accessories that come in this HUGE pack to create adorable merchandise such as: Party Invitations, Greeting Cards, Wall Decor, Journal and Album Covers, Notepads, Letterheads, Pillow Covers, Logo Designs, Business Cards and More! YOU DON'T HAVE TO BE A DESIGNER and you don't have to know how to use Photoshop! All these illustrations come in high resolution files with a transparent background that you can use in any photo editing program. I've even included a Tutorial for Beginners teaching you exactly how to use these graphics to make something awesome. Just a few easy steps and you will be creating all the things in no time! • 1 Circle Frame with White Hand-Lettered Words: "Keep Your Head in The Clouds, That is Where All the Best Ideas Happen"